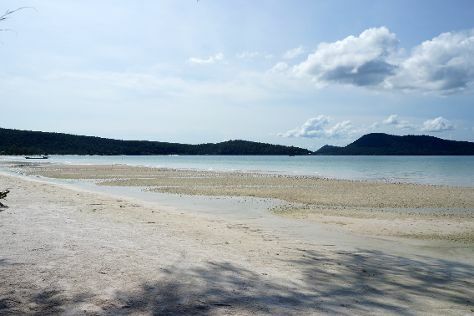 Located just a 10-minute boat ride from Koh Rong, Koh Rong Samloem is home to just 300 people--it remains relatively unspoiled by tourism, featuring wide, white-sand beaches and thick swathes of jungle. Start off your visit on the 23rd (Wed): take a tour by water with Boat Tours & Water Sports and then kick back and relax at Saracen Bay Beach. To find photos, maps, reviews, and other tourist information, you can read our Koh Rong Samloem trip itinerary maker . Philadelphia, USA to Koh Rong Samloem is an approximately 30-hour flight. The time zone changes from Eastern Standard Time to Indochina Time, which is usually a 12 hour difference. Finish your sightseeing early on the 23rd (Wed) so you can travel to Bangkok. Bangkok is known for historic sites, shopping, nightlife, spas, and nature. Your plan includes some of its best attractions: explore the historical opulence of The Grand Palace, take in the spiritual surroundings of Temple of Dawn (Wat Arun), look for all kinds of wild species at SEA LIFE Bangkok Ocean World, and browse the different shops at Siam Paragon. To find photos, ratings, maps, and other tourist information, you can read our Bangkok trip itinerary website . The Route module can help you plan travel from Koh Rong Samloem to Bangkok. In January, daytime highs in Bangkok are 88°F, while nighttime lows are 72°F. Wrap up your sightseeing on the 26th (Sat) early enough to drive to Pattaya. Famous for its nightlife and activity-filled seafront, Pattaya remains a major party destination for tourists and expats in Thailand. On the 27th (Sun), meet the residents at Underwater World Pattaya, then take in nature's colorful creations at Nong Nooch Tropical Botanical Garden, then admire the striking features of Sanctuary of Truth (Prasat Sut Ja-Tum), and finally don't miss a visit to Walking Street Pattaya. Here are some ideas for day two: enjoy the sand and surf at Jomtien Beach, have some family-friendly fun at EasyKart, and then get your game on at Ripley's World Pattaya. To find reviews, traveler tips, photos, and tourist information, read Pattaya tour itinerary maker . Traveling by car from Bangkok to Pattaya takes 2 hours. Alternatively, you can take a shuttle; or take a bus. In January, plan for daily highs up to 87°F, and evening lows to 70°F. Finish up your sightseeing early on the 28th (Mon) so you can travel to Chiang Mai. Discover the diverse history and culture of northern Thailand during a holiday in Chiang Mai, the largest and most significant city in the region. Start off your visit on the 29th (Tue): surround yourself with nature on a nature and wildlife tour. On your second day here, take in the spiritual surroundings of Wat Phra Singh, then enjoy breathtaking views from Wat Phra That Doi Suthep, then contemplate in the serene atmosphere at Wat Ched Yot, and finally soothe aching muscles at some of the top local wellness centers. 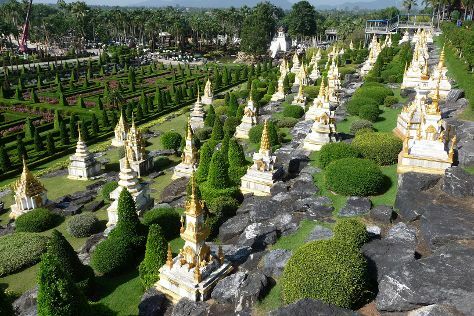 For other places to visit, where to stay, photos, and more tourist information, you can read our Chiang Mai online trip itinerary planner . Do a combination of train, taxi, and flight from Pattaya to Chiang Mai in 3.5 hours. Alternatively, you can do a combination of bus and flight; or drive. Traveling from Pattaya in January, Chiang Mai is slightly colder at night with lows of 62°F. Wrap up your sightseeing by early afternoon on the 31st (Thu) to allow time for travel back home.